Twelfth child of Allan and Mary, Aaron Charles, or Jack as he was mostly known, was born at West Tamworth and he, like other members of the family, started out as a carrier at Warialda. 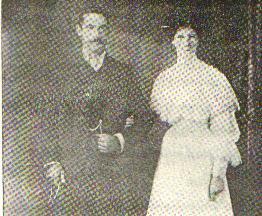 He married Ethel Estelle Mead whose family were farmers in the Warialda area. She was born at Orange in 1881 and then the family moved to Warialda. Very little is known about their early life as Jack was a quiet fellow, very reluctant to discuss his former life even with his family. It is believed that family relationships were not all they might have been and he left Warialda and moved to Armidale. He purchased an hotel at Cooney Creek about half way between Armidale and Hillgrove. The miners of the area used to congregate here on Saturday night often tended to get a bit boisterous so Jack used to place an axe on the bar as a reminder to patrons to behave. Daughter, Dorothy, can remember on one such occasion her Aunt Dora putting her and her sister Laura under the bed for safety. Hazel Estelle: 23 Aug, 1925. Dorothy, Laura and Bob were born in Warialda and Norman and Hazel in Armidale.